I Hit the Secondhand Book Jackpot! I've posted before about the June long weekend secondhand book sale. I go every year (they had one in March this year too). As usual, I went with Mark & Stevie, & left feeling like a pirate who'd just plundered the most amazing treasure trove ever! Stevie found this big stack of King Penguin books from the 1940s (all of them $5 or $7.50 each & in pretty good condition) & in a very civilised fashion with no hair-pulling whatsoever, we went through them, picking out favourites, divvying them up so we each got to buy a few. I can't recall all of theirs, but there was one about freshwater fish, another mushroom one, wild flowers, reptiles, one about ballet, children's art, Scottish costumes - lots! Here are mine, with a couple of plates from each. The covers, as you can see, are gorgeous, & the illustrations are as fresh & rich as the day they were printed. What an amazing range of subject matter the King Penguins explore, I think I might have to collect some more - I love them so much! Popular English Art, written by Noel Carrington, illustrated by Clarke Hutton. 1945. Popular English Art, written by Noel Carrington, illustrated by Clarke Hutton. 1945. A Book of Toys, written & illustrated by Gwen White. 1946. British Birds on Lake, River & Stream, written by Phyllis Barclay-Smith, illustrated by John Gould. 1939. A Book of Roses, written by John Ramsbottom, illustrations from Redouté's Roses. 1941. Seashore Life and Pattern, by T. A. Stephenson. 1944. 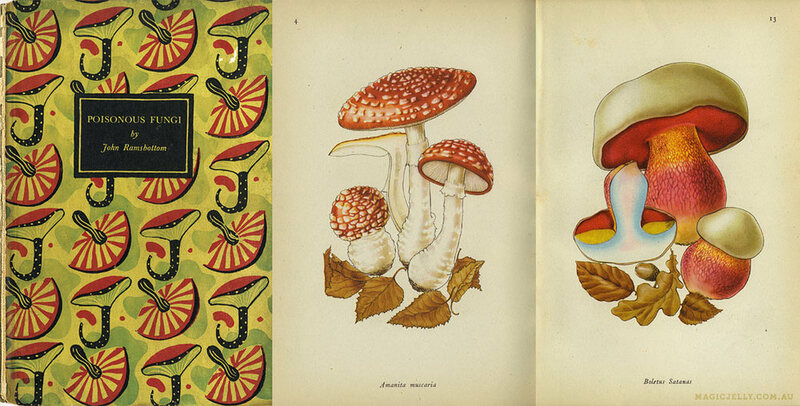 Poisonous Fungi, written by John Ramsbottom, illustrated by Rose Ellenby. 1945. Fashions and Fashion Plates 1800-1900, by James Laver. 1943.